Suspected Boko Haram militants killed at least six Christians and burned down a church in the northern Nigerian state of Yobe late on Christmas Eve, according to Nigerian army and local officials. The attack against the Church of Christ in Nations occurred in Peri village near the economic hub of Potiskum. The attackers killed a pastor and at least five worshipers during Christmas Eve services. “A group of gunmen came into the village at midnight and went straight to the church… they opened fire on them, killing the pastor and five worshipers. They then set fire to the church,” Usman Mansir, a resident of the village, told Nigeria’s PM News. Residents also claimed that the gunmen set fire to several homes surrounding the church, adding that many residents who lived near the church had fled during the attack and were still in hiding. A separate attack against worshipers at the First Baptist Church in Maiduguri, Borno state, killed a deacon and five church members, according to CNN. Borno state has a predominantly Muslim population, and Boko Haram considers Borno its de facto headquarters, according to the BBC. Boko Haram has yet to claim responsibility for the Christmas Eve attacks, but the militant organization carried out a wave of similar attacks against churches and Christians in 2011 and 2010. Earlier this year, the al Qaeda-linked Boko Haram stated that it seeks “to eradicate Christians” from areas in Nigeria. Attacks attributed to Boko Haram on Christmas last year, including on a Catholic church near the Nigerian capital, killed at least 44 people. More recently, on Nov. 25, Boko Haram suicide bombers killed 11 people in an attack on a church at a military base in Kaduna state. Boko Haram has repeatedly attacked churches on Sundays during services and on holidays such as Christmas and Easter, in order to kill as many Christians as possible. Prior to the Christmas Eve massacre in Potiskum, Nigerian state security forces clashed with Boko Haram militants throughout Potiskum City. 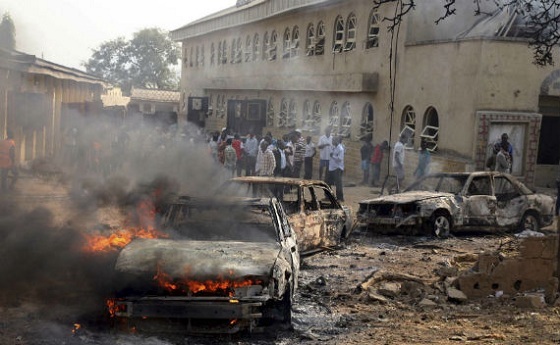 Militants bombed a local police station and attacked a bank branch before being engaged by Nigerian security forces. A local police chief and 14 militants were killed in the clashes, which reportedly lasted for hours. According to an account by the Associated Press, more than 770 people have been killed in Boko Haram attacks so far in 2012, making it the worst year yet for violence attributed to the group.